If you’ve been following us over at ATH Records, you’re surely aware of how excited we are for 2018! 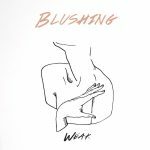 We’ve got some great releases, but the first will be a 12″ EP for Blushing; they’ve titled the EP Weak. Yesterday DKFM premiered the title track on their shogegaze radio show, and I wanted to make sure you had an ample chance to hear it too, just in case you missed it accidentally. For those just being introduced to the band, you’re in for a treat, as they perfectly mesh the qualities of dream pop and shoegaze’s angular guitars; you’re really going to love it. We’ll be releasing it on January 26th, but you can grab it HEREfrom us right now.